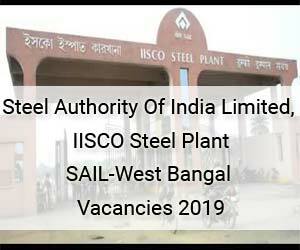 New Delhi: The Steel Authority Of India Limited (SAIL Burnpur), IISCO Steel Plant (ISP), Burnpur West Bengal has released 23 vacancies for General Duty Medical Officer (GDMO) and Specialist posts on Contractual Basis. The selection will be done through walk-in-interview. Last date to apply: 11-04-2019. Interested and eligible candidates may walk in for an interview from 9:00 am to 2:00 pm at Confluence, Opposite Post Office, Burnpur, Dist: West Burdwan, West Bengal-713325 on 09/04/2019 (Tuesday) and at the 7th Floor of SAIL House at 50 Jawaharlal Nehru Road, Kolkata on 11/04/2019 (Thursday). The Vacancies are in the Department of Radiology, Pediatrics, Orthopaedics, Ophthalmology, Obstetrics & Gynaecology, General Medicine, General Surgery, Anaesthetist, General Duty Medical Officer. GDMO: MBBS from MCI recognized university/ institute. Pediatrics- MBBS with MD (Pediatrics) / Diploma in Child Health from MCI recognized university/institute. Orthopedics- MBBS with MS (Ortho) / Diploma (Ortho) from MCI recognized university/ institute. Ophthalmology- MBBS with MS/MD (Ophthalmology)/ Diploma (Ophthalmology) from MCI recognized university/ institute. Gynaecologist/ Obstetrics- MBBS with MS (O&G) or Diploma in Gynecology & Obstetrics from MCI recognized university/ institute. Medicine- MBBS with MD (Medicine) from MCI recognized university/ institute. General Surgery- MBBS with MS (Surgery) from MCI recognized university/ institute. Anaesthesist- MBBS with MD (Anaesthesia) from MCI recognized university/ institute. The upper age limit for contractual engagement under this Scheme is 70 years. However, the doctors to be engaged should be fit to perform his/her duty. The ex-employee of SAIL and other PSUs/ Govt. who have been separated by opting voluntary retirement/ separation shall not be considered for engagement under this scheme. The ex-employee doctors will have to provide self-certificate in this regard. GDMO: Rs. 60,000/- Per Month. Specialist: Rs. 75,000 – Rs. 90,000/- Per Month. The candidates need to submit a type written application addressed to Director (M&HS) along with two copies of Photographs and a Bio-data containing name, father’s name, date of birth, educational qualification, work experience, address for communication, Mobile phone number, email id etc. on the same date before the commencement of the interview. The candidates are also advised to bring all original documents along with self-attested photocopies of certificates in support of age, educational qualification (from matriculation onwards) and work experience certificates. The doctors engaged under the scheme can be provided company accommodation (2 BHK or equivalent category) on payment basis, if desired, subject to availability. The rent and other charges for electricity, water etc. will be as applicable to the executives for that category of quarter. No HRA will be admissible in contractual engagements under this scheme. In case of ex-employee of SAIL, the medical benefits applicable/ available for ex-employees will continue. In other cases, the medical benefits shall be available for self and spouse only at the hospital, without any referrals. The doctors engaged under this Scheme will be eligible to get 10 days leave in a year subject to prior approval. The contractual engagement under the Scheme can be terminated by giving one months’ notice by either party. However, in case of poor performance, the contract can be terminated immediately. Engagement for a minimum 8 hours a day for six days in a week or 48 hours a week. If engagement is for less than 8 hours per day/48 hours a week, the rates would be pro-rated accordingly. Responsibilities for OPD/Ward/OT duties and with on-call duties for the period of engagement. General/ shift duty in OPD /Ward/shift duty at OHSC / ER-CR /CCU on all working days in a week.